For high school senior Madeleine McCluer, completing her senior project was more than just a graduation requirement at Hickory High School in Hickory, North Carolina—for her, it was personal. In October 2016, Madeleine suffered a concussion and has been dealing with the symptoms from it ever since. As part of her requirements for the International Baccalaureate (IB) diploma program, she had to complete a project that made a difference in the community in some way. She chose to raise funds for concussion and traumatic brain injury research, specifically at the Matthew Gfeller Sport-Related Traumatic Brain Injury Research Center at UNC. 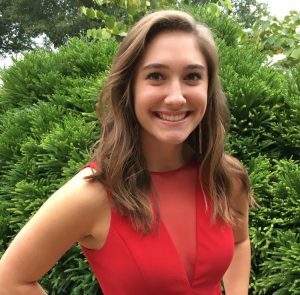 For her senior project, Madeleine raised money by coordinating a booth at one of her school’s home football games. Prior to the fundraiser, she made posters and decorated donation buckets to use as attention-grabbers at the game. During the game, she had volunteers provide entertainment, collect money, and talk to people about concussions and traumatic brain injuries to raise awareness. Madeleine raised $900 at the fundraiser—all of which she donated to the Gfeller Center. “I greatly admire the work that is done at Carolina to benefit and help others, and I appreciate the opportunity to help their efforts,” she said. At Hickory High School, Madeleine is a member of Beta Club, Mu Alpha Theta mathematics honor society, National Honors Society and vice president of Juniorettes, a service organization. She has also been a member of the cheerleading squad all four years. Madeleine will join UNC’s class of 2022 this fall. She plans to pursue a degree in biology and one day go into the medical field.